Identification. Since declaring independence on 20 July 1810 and achieving it in 1819, Colombia has changed its name seven times. Regional cultural traditions are diverse, with a broad range of distinct groups that have unique customs, accents, social patterns, and cultural adaptations. These groups are classified into three cultures: those in the interior, the countryside, and the coastal regions. Only during elections, sporting events, and beauty pageants do the regional cultures unite for a common goal. Location and Geography. Covering about 440,000 square miles (1.14 million square kilometers), Colombia has coast on the Atlantic and Pacific oceans. Lowland coastal areas give way to rain forest, the Andes, and the Inland Ilanos (plains). Colombia is connected to Central America by the Isthmus of Panama. It contains several small islands in the Atlantic, including San Andrea and Providencia, and in the Pacific, the Malpelo and Gorgona islands have been set aside as natural wildlife reserves. Colombia borders Ecuador and Peru to the south, Brazil and Venezuela to the east, and Panama to the northwest. The Atlantic or Caribbean coastal lowlands receive less rainfall than the area along the Pacific. Many industries are located within this area, along with 20 percent of the population. The fertile land supports banana and sugarcane plantations along with cattle ranches. Lush rain forest and swamps characterize the Pacific lowlands. Because of the abundant rainfall and poor soil quality, few people inhabit this region. The three Andean Cordilleras (mountain ranges) running the entire length of the country from the north to the south, occupy only 30 percent of the landmass. Most of the population lives in the inland Andean region, which begins along the Caribbean coast near Venezuela. Climatic effects are accentuated on the high elevations of these mountain ranges. The hot zone is marked by heavy annual rainfall along the Pacific coast. The temperate zone, in which 40 percent of the population lives, has moderate rainfall and moderate temperatures. The treeless regions adjacent to the cold zone usually are referred to as paramos (high plains), above which begin the nevados (snowcapped peaks). The cold zone receives heavy rainfall during the wet seasons from April to June and September to December. The northern end of this range is characterized by volcanic eruptions and earthquakes. Despite the tectonic activity, almost 80 percent of the population lives in the Andeanregion.The highlands to the east of the Magdalena Valley include Cundinamarca, where Bogota, the capital, is located. Set in the central range to the west of the Magdalena are two of the most important cities: Medellín (the second largest city) and Manizales. Farther to the south in the Cauca Valley is Cali, the third largest city, which has some of the richest farmland. This area contains some of the richest mineral deposits in the world, including gold and emeralds. Coffee plantations are plentiful in the mild climate, which also supports banana, cassava, and coca. To the east of the Andes is the broad expanse of the Ilanos, which contains more than 60 percent of the land area. The high plateau is striped with tributaries of the Amazon River and rain forest to the south. While few crops are grown in this hot, flat region, the grassland provides ample space to graze cattle. Colombia has great biodiversity with 1,550 species of birds and over 13,000 species of plants. group being mestizos, 16 percent mulattoes, and 4 percent zambos . The other 20 percent of the population is of European, African, or Indian ancestry. Caucasians, mainly descendants of Spaniards, constitute about 20 percent of the population. Antioquia and the coffee region are considered "white" departments or states because of the reluctance of European settlers to mix with blacks or Indians. Black people represent about 4 percent of the total population and live primarily on the Caribbean coast, the historical center of the slave trade. The Indian population, which is estimated to have been between 1.5 and 2 million people in the pre-conquest period, numbers between 300,000 and 400,000. There are over fifty Indian groups, many of which live in relative isolation. Linguistic Affiliation. The official language is Spanish, which was imposed during the colonial period. All Colombians speak it except some of the indigenous populations in the Amazonian basin. In major cities, English is used, particularly by the upper class, but it is not commonly understood or spoken. Outside urban areas, Spanish is virtually the only medium of communication. Colombia takes great care to preserve the linguistic "purity" of Castilian Spanish. The Colombian Academy of Language was founded in 1871 by a commission from the Spanish Royal Academy of Language; it was the first such body established in Latin America. Colombian Spanish is marked by the presence of numerous cultural expressions. In addition to Spanish, over 200 indigenous languages and dialects are spoken. Symbolism. Patriotic symbols represent the war of independence and the founding fathers. Francisco Miranda, a Venezuelan, designed the national flag in 1806. Adapting the red and yellow of the Spanish flag, Miranda divided the two colors by a stripe of blue to symbolize the ocean separating the independent country from the motherland. The upper half of the flag is yellow, symbolizing the natural riches of the country, while the lower half is divided into two equal parts of blue and red, with the red symbolizing the blood shed in the war for independence. In 1834, the national shield, Arms of the Republic, was added to the flag to represent the defensive armament used in early battles. Another important national symbol is the condor, which signifies liberty and sovereignty. Emergence of the Nation. The discovery of the country's coastal lands in 1499, followed by Spanish occupation for the next 300 years, indicates the integral role Spain played in the region's cultural, religious, and political development. In the early part of the 1500s, Spain attempted to control the Caribbean and Pacific coastlines, establishing Santa Marta in 1525 and Cartagena de Indias in 1533. In that year, the conquest of the Incas in Peru gave the Spaniards strategic positions in the north and south for the subjugation and colonization of Colombia. By the middle of the sixteenth century, the Spaniards had established a major foothold in the Americas. During this period, the Andes were occupied by a number of indigenous groups that ranged from stratified agricultural chiefdoms to tropical farm villages and nomadic hunter-gatherer groups. The social structures of these groups were destroyed during the conquest, as Indians were forced into slavery to exploit the natural riches of the country. As the number of casualties in the Indian population increased due to starvation and disease brought by the conquistadors and to the intense labor of slavery, Spain imported slaves from Africa for gold and silver mining on the Pacific coast. The tri-ethnic composition of the population during this period led to the ethnic terminology still used today. Spaniards were referred to as Peninsulars, while their South-American-born descendants were called criollos (Creoles). Miscegenation produced people of mixed race known to the Spaniards as the castas (castes). These were mestizos from the intermarriage of whites and natives, mulattoes from that of blacks and whites, and zambos from that of blacks and Indians. Unfair practices and decrees by the Spaniards created a desire for independence. Most traumatic was the practice of encomiendas, an institutionalized system in which Indians were "entrusted" to the care of Spaniards called Encomienderos .These "caretakers" provided the Indians with religious instruction and a livelihood in exchange for their labor. In practice, this system amounted to enslavement. In 1781, 20,000 Indians and mestizos attempted to march on the capital in what became known as the Comuneros revolt, but the revolt was crushed and its leaders were executed. There was little or no support from the Creole population, but some Creoles were appalled by the brutality of the Spaniards and began to spread the rebellious sentiment. The call for vengeance spread to other provinces, as government officials excluded Creoles from high governmental positions. After several minor uprisings, Colombia achieved independence after the decisive battle of Boyacá on 9 August 1819 under Simon Bolivar, a Creole who joined the patriotic movement in 1810. National Identity. There is not a unique national culture separate from the cultural influence of colonial Spain. Instead of resisting Spanish cultural influences, most indigenous groups embraced them. Rather than having a common culture, Colombia is a country with many distinct regional cultures. Ethnic Relations. Past relations with other regional cultures were based on the hierarchical society imposed by Spain, in which the upper echelon of "white" Spaniards enjoyed wealth, power, and prestige while blacks and Indians were at the bottom of the socioeconomic hierarchy. After independence, Creoles quickly replaced Spaniards in the upper echelons of the new society. Qualified mestizos and mulattoes also ascended to high positions, but their inclusion was based on their level of education, wealth, and "whiteness." Colombians continue to identify themselves according to their regional heritage, physical appearance, and socioeconomic status. The nation's architecture reflects seventeenth century Spanish colonial origins. Regional differences derive from those in Spain. Thus, hints of Moorish and Castilian architecture are evident in many cities. Many areas have had difficulty maintaining older structures, and the climate has destroyed many Baroque buildings. Some of the architectural gems are the many churches that dot the landscape. The detailed interiors of the country's churches are reflective of the Medieval and Renaissance churches in Spain. Newer buildings in larger cities utilize modern styles with adaptations of the Baroque style supplemented with wood and wrought-iron elements. In the nineteenth century, a new form of architecture began to develop from the efforts of artisans who incorporated elements of Greek, Roman, and Renaissance art. This style, known as republicano, represented the independence of Colombian art. This movement incorporated cement and steel building materials. Many government buildings follow the republicano architectural style. Apartment towers in Bogota. High-density public housing projects are common in the cities. past. In their place, it constructed modern buildings with an international flavor. Republicano homes are typically built on a single level with an A-frame roof. Houses in the more crowded cities often have two or more stories and reflect a European influence. Most people lived in single-family dwellings until the migration to urban centers in the late 1940s and early 1950s. 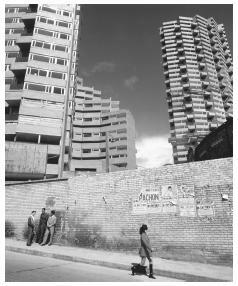 The need for adequate housing persuaded the government to invest in high-density public housing projects during the early 1950s. In the poorer areas, large families live in small houses constructed from cinder blocks and covered with an adobe made of clay, cow manure, and hay. Park space is limited to larger towns and cities that were founded by the Spanish. Parks have areas where social activity is encouraged; long benches are placed close together so that people can have space around them without restricting communication. Few formal parks exist outside the cities, although people congregate around churches or other local monuments. Food in Daily Life. Most middle-class families eat elaborate meals that reflect Spanish and indigenous traditions. A typical meal is identified by size rather than content, such as a light breakfast, a substantive midday lunch, and a lighter meal in the early evening. Dinner consists of fresh fruit, homemade soup, and a main dish with meat or fish accompanied by rice and/or potatoes. Lower-income people eat a more carbohydrate-rich diet. Meals usually end with a very sweet dessert, frequently made from panela, a type of brown sugar. There are regional differences in foods. In the interior rural regions, a hearty breakfast consists of a strip of pork, rice and beans, sweet plantains, and a large steak with fried eggs. Dinner is similar, except for the eggs. In the coastal region, the emphasis is on seafood. In Cartagena, the typical lunch consists of rice with coconut, fried plantains, and shrimp. Colombians enjoy a variety of national and international cuisines. Specialty dishes are eaten during holidays. A dish associated with the capital is ajiaco, a stew with three types of potato, chicken, and corn, that is served with capers, cream, and avocado. Another dish served during religious holidays is pasteles, while along the coast, people eat sancocho, a fish or chicken stew. Colombians consume large quantities of beer and coffee and relatively little milk or wine. Aguardiente combines local rum and a corn of sugar brandy. Basic Economy. The economy is dependent on manufacturing and agricultural exports, but this domestic production relies on expensive imports such as tractors, power generators, and industrial machinery. 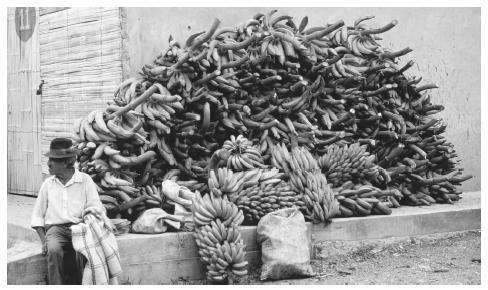 Commercial agriculture stresses bananas, cut flowers, sugar, and coffee. In the world's second leading exporter of coffee, the economy is sensitive to fluctuations in the market price. Manufacturing exports include textiles, garments, chemicals, and metal products. Despite rich mineral deposits, Colombia derives less than 4 percent of the gross domestic product (GDP) from mining. Economic progress has resulted from the government's efforts to make the economy more specialized and productive by encouraging trade, deregulation, and financial investment. While the executive and legislative branches can intervene in economic matters, the hands-off policy of the government has resulted in a 3 percent annual growth of the economy since the ending of government subsidies. Land Tenure and Property. Most of the productive agricultural land forests are privately owned. The structure of owner-operator relationships varies: coffee is grown on small plots by sharecroppers, whereas plantation agriculture and forestry involve multinational joint ownership using local labor. Land containing valuable minerals and hydrocarbons generally reverts to the government, which arranges contracts between domestic and foreign corporations. Public land includes 43 national parks. The government has designated special lands for the indigenous groups. Land distribution has been a difficult issue, and deforestation is being examined in the context of management practices and trade policies. Commercial Activities. Fifty-one percent of the GDP comes from the commercial sector, which includes utilities, transportation, communications, wholesale commerce, real estate, retail banking, and stock exchanges. While these business sectors operate domestically, many have an international presence, including investment banking, insurance, commercial real estate, hotels, and advertising. Major Industries. The primary industries are in the manufacturing sector, which employs over 35 percent of the workforce. The largest industries in this sector are textile, garment, furniture, and corrugated box manufacturing. Heavy industries also make a significant contribution to the GDP, including oil production, coal mining, chemical and resin-producing plants, and forestry. Although tourism is a major industry, the growth of this sector has been hindered by instability in the Andean and forested regions. Trade. Exports include coffee, cut flowers, emeralds, and leather goods—most of which go to the United States and Europe. Other significant exports are oil, coal, and bananas. A free-market economy has allowed the country to benefit from foreign trade and foreign investment. After the North American Free Trade Agreement, Colombia established a similar trade pact between itself and several Latin American nations. Colombia is seeking similar trade pacts with it neighbors to the north, including the United States. Division of Labor. The labor force consists of manual and semi-skilled, highly skilled, managerial, and professional segments. In the agricultural and manufacturing sectors, manual or semi-skilled labor is physically demanding and wages are low. Workers who are classified as highly skilled include artisans and carpenters and supervisors in industrial plants and farms. Managers and professionals include highly educated individuals who occupy the top decision-making or policy-making roles in industries, universities, and the government. Bananas are a staple crop in Colombia's thriving agricultural sector. Classes and Castes. The massive urban migration that began in the 1950s saw a middle class emerge, resulting in a three-class system: upper, middle, and lower. The upper class, which includes 20 percent of the population, accounts for about 75 to 80 percent of the gross national product. This group tends to be made up of individuals of unmixed European ancestry. Within this class, there is an elite referred to as the "oligarchy" that enjoys wealth and financial security, political power, and education. This group may be considered a caste, since membership is largely due to birthright, not to individual ability. A wide gap separates the elite from the masses. Unlike the elite, this group has few opportunities for social mobility. Social inequality is evident in the lower class, whose members are often malnourished, poorly housed, disease-ridden, and illiterate. White people continue to dominate the upper class, while mestizos and mulattoes constitute the middle and lower classes. Blacks and Indians make up a significant portion of the lower class. Historically, blacks felt socially superior to Indians despite the fact that Indians occupied an officially higher position in society. Symbols of Social Stratification. White or light skin is associated with being Spanish. Today, people may not be aware of this association, but they still equate being white with being wealthy. The style of clothing preferred by urban professionals and the middle and upper classes is similar to that in the United States. White, mestizo, and mulatto men and women prefer conservative dark suits. Individuals from rural areas often wear the same clothes in the fields and at home. Men usually wear loose-fitting pants, while women wear loose-fitting skirts. Cloaks are worn by both sexes in the cold, rural highlands. All three classes in the interior, especially in Bogotá, speak a deliberate and grammatically correct Spanish, whereas coastal speech patterns have a rapid tempo. People from the interior are more proper and ceremonial in social interactions, while coastal inhabitants are usually more trusting and carefree. Government. The government has an executive branch led by an elected president, a bicameral (House of Representatives and Senate) legislative branch, and a judicial branch. The president is elected to a four-year term by popular vote and may not be reelected. The president runs for office with his vice president, and names the cabinet, which consists of ministers with administrative powers. The president's duties include enforcing laws, conducting foreign affairs, supervising public finances, maintaining public order, and serving as commander-in-chief of the armed forces. In the Congress, senators are elected by national vote, while representatives are elected by the people in their districts. Members of both houses may be re-elected to an unlimited number of terms. Congress meets only twice a year but may be called for additional sessions by the president. The House of Representatives appoints an attorney general. The responsibilities of the Senate include approving military promotions, declaring war, permitting foreign troops to enter the national territory, litigating impeachment proceedings against the president, and electing supreme court justices. Under the constitution of 1991, the Constitutional Court and Council of State were added to the Supreme Court, which is the court of final appeals for ordinary legal matters, annulments, and contractual disputes. It also tries public officials for misconduct in office. The Council of State hears cases involving administrative issues and proposes laws regarding administrative practices, while the Constitutional Court is charged with reviewing laws, treaties, and other public policies to ensure that they do not violate the constitution. Leadership and Political Officials. One of the most important informal decision-making groups among the upper class is referred to as roscas , a term that symbolizes the interconnecting networks in the political system. These groups have a membership structure that parallels the society of colonial Spain. These informal groups are found in the political, social, economic, and financial sectors. Roscas have been successful in monitoring and controlling some social, political, and economic changes. At this level, most political decisions are made and many careers are determined. Roscas link influential individuals and institutions so that universities, banks, industries, and agricultural interests may be coordinated and controlled by a few people. Inclusion in these such groups is limited to members of the upper-middle and upper classes. Another informal custom is the palanca ("leverage"), in which an influential friend or relative tries to help an individual gain a position. Allegiance to political parties and family ties are the source of most palancas . After independence, the founding fathers formed the Centralist and Federalist parties, which later became the Conservative and Liberal parties. The Liberal Party advocates the separation of church and state, free enterprise, free commerce, no taxes on exportation, no intervention in matters of state by foreign nations, a free press, political liberty, decentralization of government, universal suffrage, and equal justice for all. The Conservative Party defends moral values, supports good customs, maintains close ties between church and state, protects traditional values, maintains a central government and central bank, favors tariffs, maintains the status quo and federal support of education, and calls for equal justice for all. Social Problems and Control. The modern National Police, a branch of the armed forces, was created in 1891 to enforce federal laws. With the escalation of violence during the 1980s, the size of the national force increased. However, the National Police lack a presence in many municipalities. In a country racked by violence, some judges wear masks to hide their faces in order to avoid reprisal. These "judges without faces" demonstrate the inability of the judicial system to protect its members and the general public. Over 50 years ago, many politicians tried to reform a corrupt political system that acted in favor of the privileged few. However, after the assassination of Jorge Eliécer Gaitán in 1948, old-line politicians fell into disfavor. Elected to many political positions, including his appointment as mayor of Bogotá, Gaitán had captivated the country with his dynamic oratory and articulation of social problems. The elite feared that Gaitán's popularity would ensure his election to the presidency. Gaitán's death resulted in an escalation of violence, especially in the countryside. The period between 1946 and 1956 is known as La Violencia; over 350,000 people died in an armed uprising against social and political injustice. After Gaitán's assassination, the guerrilla movements began to organize into large centralized groups. Today the two major guerilla organizations— the Revolutionary Armed Forces of Colombia (FARC) and the Army of National Liberation (ELN)—have attempted to disrupt the government and the national economy to bring about reform and social justice. They have generally targeted government buildings, military positions, and police stations, but also have attacked energy distribution and communication networks, and engaged in extortion, kidnapping, and assassination. 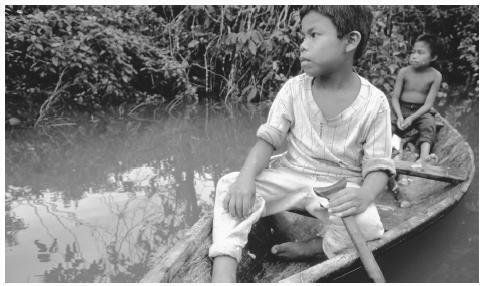 Two boys in a canoe on the bank of the Amazon River, near San Martin. The Amazonian basin is home to several indigenous populations. the guerrillas. To counter the effects of the drug trade, informal social control systems have risen to combat crime, including paramilitary organizations. Many people take the law upon themselves, and many crimes are committed in the context of personal or group retaliation. Military Activity. Numbering 150,000, the military is divided into an army, a navy, and an air force. Mandated with protecting the country's borders and territorial waters, the military has been involved in internal conflicts such as fighting against guerrillas. The social security system developed in 1843 applied only to military personnel. Other social security programs have been slow to develop. While many programs available to the average laborer are relatively new, they provide health, pension, social security, and death benefits. Individual benefits in the public sector exceed those in the private sector. The social welfare system has been expensive and inequitably applied, with only 16 percent of the population currently covered by social insurance. The poorest segment of the population is not covered by any program. These groups rely on nongovernmental organizations to supplement the limited support provided by the government. Nongovernmental organizations (NGOs) have been involved in agricultural, educational, and health programs. With the backing of the government and community leaders, organizations such as the Magdalena Medio Project have influenced public affairs. Among the priorities of NGOs are land reform projects to redistribute farmland in favor of family farming and the poor, human capital development in education to give communities control over local education, and public sector efficiency. Groups such as the Pasto Education Project and the Rural Education Project have advocated better-equipped public schools and teacher training. 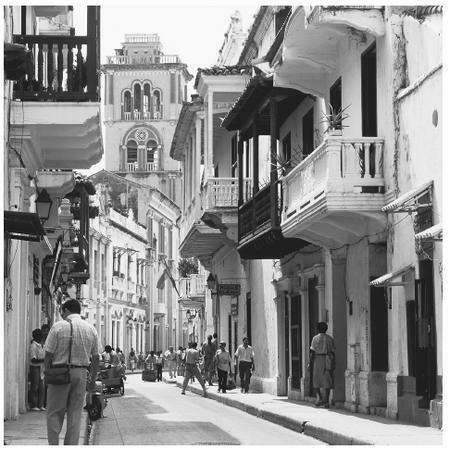 A street scene in the Colombian town of Cartagena. Houses in Colombia's cities often have two or more stories and reflect a European style. Women's World Bank and the Solidarios Financial Cooperative. Other NGOs focus on diverse aspects of the nation's economy, education, and people. The Colombian Indigenist Institute, is an advocate for many native groups. The first national labor organization, the Confederation of Colombian Workers (CTC), promotes labor reform. Having lost much of its influence, the CTC was supplanted by the Union of Colombian Workers backed by the Catholic Church and then by the Unified Central of Workers. The Relative Status of Women and Men. Gender roles have changed with the migration from rural to urban areas, but family and household organization is still marked by sexual segregation and a difference between male and female goals and aspirations. As a result of colonial influence, Colombian society adopted a culture in which men occupy a dominant role within the household as breadwinner and disciplinarian and assume responsibility for maintaining family pride and position within the community. The role of machismo is an important characteristic of public life. Machismo is not synonymous with strict male dominance—it applies to the public personification of the male family head. Machismo requires separate male and female roles in economic life and consumption, the reliance of women on men, and distinct sets of life goals for men and women. With more women holding higher-paying jobs and occupying prominent positions in society, the role of machismo is now less dominant in urban centers but is still evident in rural regions. Machismo defines a woman's role as a mother in addition to her conjugal role. The traditional male-female relationship assumes that the woman puts her husband's wishes before her own. She is responsible for the care of the children and household, but the husband makes decisions about the household's basic necessities. While male familial roles are relatively consistent across economic groups, female roles vary as a result of the modern economy. In upper class and some middle class families, women avoid working outside the home in order to preserve family status, honor, and virtue. Women from lower class and lower-middle class families often hold jobs outside the home or work in the fields to contribute to the family's subsistence, giving them a greater degree of equality. Many couples farm fields owned through the wife's family, and in this case it is difficult for a husband living with his wife's family to exercise control over the wife. Women have assumed visible and important roles in society. Upper class and middle class women dedicate themselves not only to the family but also to social issues and the church. Women from these groups hold a number of prominent public positions and are considered among the most politically active in Latin America. Marriage. Arranged marriages are no longer common, especially among the upper-middle and upper classes, but the members of these groups are encouraged to marry within their own class. While men and women can date whomever they wish, they must be accompanied by a chaperone. Before marrying, couples usually court for at least a year. Members of the lower and middle classes strive to marry someone outside of their class; mestizos, mulattoes, and blacks prefer to marry into white families. However, when intermarriage takes place, it is generally white males who marry Indians or blacks. Most people, especially in urban centers, are married in the Catholic Church. Upper class people use this religious rite to create powerful family unions. Church weddings are expensive and allow families to demonstrate their financial and social status. Because of the expense, members of the lower middle class may opt for a civil marriage. Others choose a consensual marriage. Divorce for civil marriages was not permitted until 1970. Domestic Unit. The nuclear family consisting of a father, a mother, and their children is the basic household unit. Upper class families usually have many children. The father is the head of the household, while the mother is responsible for child rearing, homemaking, and the basic education of the children. Lower class and some middle class wives work in the city or next to kin in the fields. Inheritance. Parents bequeath property to their children in equal shares. In rural families, sons and daughters may inherit property with the condition that they will continue to work the land. In urban centers, parents may leave a family business to their children to share and run. Kin Groups. Large upper class families have an extended kin group in which the oldest member receives the most wealth and prestige. Family and kin group members interact regularly and generally live close to each other in urban areas or on the same land or estate in rural locations. Family members participate in social activities to expand the family's wealth. In times of severe financial difficulties, families lacking a socioeconomic network, may be displaced into a lower class. Infant Care. Mothers from the upper class prefer to give birth in clinical settings, while those in the lower class usually have babies at home, sometimes with the help of a midwife. Upper class families use cribs and playpens. The sleeping quarters of the child are usually separate from those of the parents. In poorer families, a child usually sleeps in the same bed as the mother or next to the mother on the floor. Churches, like the one shown here in Anitoquia, are some of the last examples of Medieval or Renaissance architecture in Colombia. are taught right from wrong, encouraged to be obedient, and informed about the need for higher education. Obedience to adults, conformity to social expectations, and religious devotion are important qualities in a "good" child. The only ceremonial initiations rural and urban children receive are the religious rites of the Catholic Church. Within the first year, a baby is baptized. Families often use the rite of baptism to achieve upward social mobility. Choosing distinguished godparents brings prestige to the parents and offers the child social and economic networks. At age four or five, children enroll in elementary school where they learn to read, write, and do simple math as well as study geography and history. Completion of secondary school leads to a diploma that qualifies a student for college. Higher Education. The Catholic Church established the first universities before 1700; the first public universities were founded much later. Today there are over 40 universities. National universities receive funding from the government, which in the 1958 constitution was mandated to spend at least 10 percent of the national budget on education. Higher education is considered necessary to achieve professional goals and to contribute to the progress and prosperity of the country. However, the university system reinforces social stratification. Higher education is coveted by all, but only the middle and upper classes can afford to attend a university. Social interaction in the upper class is generally formal and respectful. The members of lower socioeconomic groups from the interior pride themselves on their good manners. Unlike their coastal counterparts, lower class individuals in the interior express mutual respect for each other and their elders; women are treated respectfully and given special attention. Personal space is highly regarded, so conversations take place at arm's length. The violation of this space even in crowded stores and museums is considered disrespectful and hostile. Exceptions occur in crowded bus stations and on buses. Formal greetings among strangers are mandated, whereas salutations among acquaintances are informal. Religious Beliefs. Ninety-five percent of the people consider themselves members of the Roman Catholic Church and attach great importance to Catholic sacraments. More than 85 percent of Catholics in urban parishes attend mass regularly. People in rural areas are said to be more devout than those in the cities, but their Catholicism is different from that of the urban upper and middle classes. In the countryside, Catholic practices and beliefs have been combined with indigenous, African, and sixteenth-century Spanish customs. People pray to a patron saint, who is considered to be more accessible than God. Rural villages have a patron saint who is honored each year with a fiesta. Traces of rural folk religion also are found in urban lower class communities, particularly those with many rural migrants. Although the 1991 constitution established religious freedom and does not mention the Church by name, the Catholic Church continues to have significant influence. A Protestant movement has attracted more than 260,000 people. Protestants are a minority on the mainland but a majority on San Andres and Providencia islands. There are also small contingents of Muslims and Jews. 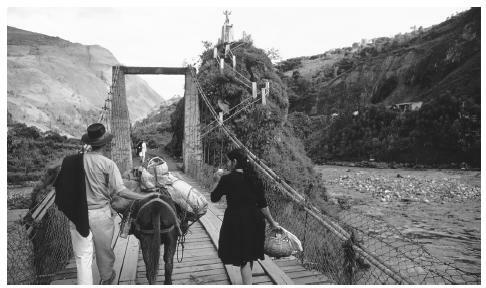 A farmer, his wife, and their donkey cross a wooden footbridge to the market at Puente de Calamate, Colombia. The Spanish began a process of conversion among the Indians in the sixteenth century, and the institutionalization of the Catholic Church was a high priority for the colonial government. That church destroyed most of the indigenous rituals and religious customs. The Inquisition had the authority to summon and interrogate, often using torture, any subject accused of heresy and had the power to confiscate the property of convicted persons. Religious Practitioners. Local priests are often the primary authority figures in small communities. Most priests and bishops were born in the country. Like most elites, priests have gravitated toward urban areas, leaving a void of religious leadership in some areas. Colombia supports more than 30 monasteries and 80 convents. Rituals and Holy Places. Priests in churches perform most Catholic sacraments. The rite of baptism is the sacramental entry into Christian life, and communion is a memorial of Christ's death and resurrection. Death and the Afterlife. Christian dogma holds that the spirit lives on after the body has died. A divine judgment of the person's life determines the well-being of the spirit after death. An elaborate ceremony involving the preparation of the deceased for burial by relatives is accompanied by prayer and followed by a period of mourning. Health care has improved dramatically over the last 30 years, but this has occurred mostly in upper class and middle class urban areas. The urban poor and people in remote regions have limited access to food, housing, and medical treatment. There has been a reduction in the infant mortality rate and an increase in life expectancy over the last decade. In rural areas, women must contend with cultural and legal restrictions on health care. Twenty percent to thirty percent of maternal deaths in those areas are due to induced abortions, which usually are performed outside of medical facilities. Sangre muertes "blood deaths," are violent criminal attacks and murders related to activity by drug cartels that primarily affect men under age forty-five. The increase in guerilla activities also has resulted in many deaths, especially in remote areas. 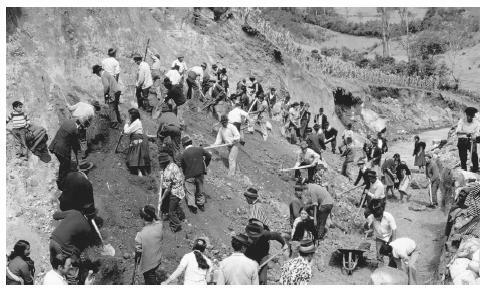 Villagers of all ages dig through a hill to build a road in rural Colombia. including dengue and yellow fever, and a variety of tropical parasitic infections. Traditional remedies are commonly used, particularly in rural and remote areas. Many forms of traditional medicine rely on indigenous plants. Traditional healers called Taitas from the yagé culture have tried to maintain their indigenous medical practices. In recognition of the importance of the plants used in traditional medicine, those healers have attempted to preserve the forest in the Amazonian region. Numerous national holidays celebrate the country and its culture, and many religious holidays are celebrated as national holidays. Important church holidays include the Epiphany (6 January); Holy Week, which includes Easter (March or April); All Saints Day (1 November); the Immaculate Conception (8 December); and Christmas (25 December). Colombia also celebrates the feast days of various saints on both a national and a local level. Feminine beauty is considered very important, and the country celebrates it each November with the crowning of Miss Colombia. Apart from soccer, the Reinado de Belleza is the most popular sports event. Other important national holidays are Independence Day (20 July), which celebrates the declaration of independence in 1810, and 7 August, which commemorates the Battle of Bocayá, where Bolívar defeated the Spanish. Other holidays center on regional and local cultures, such as the Carnaval of Barranquilla, the Cartagena International Caribbean Music Festival, the Medellín flower fair, and the Festival of the Devil in Rio Sucio. Support for the Arts. Art is considered one of the defining features of Colombian culture. The arts are supported through private individuals and foundations such as the Telefonica Foundation, the Chamber of Commerce of Medellín, the Tobacco Company of Colombia, Federation of Coffee Producers, and the Bank of the Republic of Colombia, which supports the world renowned Museum of Gold. The government, through the Ministries of the Interior and Education, also provides substantial support for numerous museums, theaters, and libraries throughout the country. Among the government supported institutes are the National Museum of Colombia, and the Colombian Institute of Culture, both of which support artists while striving to preserve Colombia's rich history. In addition to these traditional institutes, local governments and private transportation companies support local artists by hiring them to colorfully decorate city and town buses. Literature. Colombia did not begin to develop a literary tradition until the arrival of the Spanish, and its literature still shows a strong European influence. After independence, writers began to develop their own styles, and wrote about national themes instead of European ones. Early writers such as Jorge Isaacs and José Eustacio Rivera addressed the values of rural peasants and their struggle for existence. These and other stories about the regional populations influenced the development of distinct regional literary styles. One of the writers whose style grew out of the artistic influences of the Caribbean coast is Gabriel García Márquez, winner of the Nobel Prize in 1982. As a member of JoséFélix Fuenmayor's Group of Barranquilla, García Márquez became known for his juxtaposition of myths, dreams, and reality ("magic realism"). García Márquez and other writers are influencing a group of writers who embrace modern and post-modern themes. Graphic Arts. Over 2,000 years ago, native peoples in the Andes produced intricate artwork. After colonization, native artistic influences were abandoned in favor of European styles. However, Colombia is attempting to carve a niche in the international art world with the production of works by painters such as Fernando Botero and Alejandro Obregón and the sculptor Edgar Negret. One of the leaders of national art was Pedro Nel Gómez, whose murals featured social criticism. Other artists followed the nationalistic and indigenous themes of the movement, although their technique was more traditional. Colombia takes pride in its artists, many of whom still use nationalistic and indigenous themes while incorporating international elements. Performance Arts. The diversity of Colombia's music is intimately linked to its many distinct regional differences. Vallenato, a type of Colombian music and dance, originated on the Atlantic coast and is enjoyed throughout the country. Currulao, a type of music from the Pacific coast, uses the sea, rain, and rivers as its central themes and employs mostly ordinary wooden instruments. In the interior of the country, the two traditional types of music played throughout the Andean region are the Bambuco and the Guabina. Both types of music have considerable mestizo influence, often using as their undercurrents themes that emphasize the earth, mountains, and lakes. Joropo is considered to be "fierce" or Plains' music because it is played in the Llanos Orientales, or Eastern Plains, and reflects the cattle ranch workers' arduous way of life. Cumbia music and dance are considered Colombian national treasures whose rhythmic cadence and melodies echo the mulatto and indigenous flavor; it has become the flagship of Colombia's musical genres. Special mention should be paid to the "musical city" of Ibagué, which has contributed to the enrichment and dissemination of Colombian music. The country has produced important work in biology, medicine, geology, mathematics, physics, genetics, psychology, and anthropology. As the home of several pre-Colombian archaeological sites, Colombia has become the source of much of what is known about Latin America before European settlement. Colombia also has been at the forefront of studies of volcanology and seismology. Medical research in the country is considered among the best in Latin America. Individuals who have made important contributions to the field include José Ignacio Barraquer, Rodolfo R. Llinás, and Manuel Patarroyo. Research in the physical and social sciences is funded largely by the government, although numerous private organizations also provide assistance. Bagely, Bruce M. "The Society and Its Environment." In Colombia: A Country Study, 1990. Berquist, Charles W. Coffee and Conflict in Colombia, 1886–1910, 1986. Blossom, Thomas. Narino: Hero of Colombian Independence, 1967. Brusco, Elizabeth E. The Reformation of Machismo: Evangelical Conversion and Gender in Colombia, 1995. Bushnell, David. The Libertor, Simón Bolívar, 1970. ——, and Neill Macaulay. The Emergence of Latin American in the Nineteenth Century, 1988. ——, and Wilheim G. M. Hegel. The Making of Modern Colombia: A Nation in Spite of Itself, 1993. Davis, Robert H. Historical Dictionary of Colombia, 2nd ed., 1993. Griffin, Charles C. "Enlightment and Independence." In John Lynch, ed., Latin American Revolutions, 1808– 1826, 1994. LeGrand, Catherine. 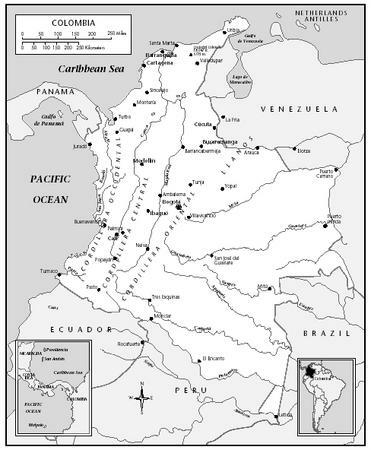 Frontier Expansion and Peasant Protest in Colombia, 1830–1936, 1986. Martz, John D. The Politics of Clientelism: Democracy and the State of Colombia, 1997. Pearce, Jenny. "The People's War." NACLA Report on the Americas, 23 (6): 13–21, 1990. Reichel-Dolmatoff, G. Colombia: Ancient People and Places, 1965. Sánchez, Gónzalo. "The Violence: An Interpretive Synthesis." In Charles Bergquist, Ricardo Penaranda, and Gónzalo Sánchez, eds., Violence in Colombia, 1992. Schultes, Richard Evans. Where the Gods Reign: Plants and Peoples of the Colombian Amazon, 1988. Sharpless, Richard E. Gaitán of Colombia: A Political Biography, 1988. ——. Colombia: Social Structure and the Process of Development, 1967. Wade, Peter. Blackness and Race Mixture: The Dynamics of Racial Identity in Colombia, 1993. Williams, Raymond L., and Kevin G. Guerrieri. Culture and Customs of Colombia, 1991. I Love Columbia!!!! even tho i never been there. but im gonna go someday!! it is long and should have sub catagories. i am doing a report for school and it took me a while to find what i was looking for. It had great information and was very helpful!!!!!!!!!!!!!! soo good. i am researching for a latin america project at school. awesome!!!!! only info on Colombian architecture I have found. wow ,iam doing a report on colombia and this is great info!!! this was very helpful for the roport i am doing thanx alot!!! very detailed paragraphs about Colombia. Can't beat it. This is really good info. I have been several times to Colombia and I love it there. Hope to marry a Colombian seniorita soon. FOUND THIS ARTICLE EXTREMELY REFRESHING AND INTERESTING. this is a very good, accurate site. It helped me a lot in finding what I needed to know. Thank you for being up on the computer. VERY VERY HELPFUL, I WAS DONE WITH FINDING OUT EVERY ASPECT OF MY PROJECT IN NO MORE THAN ONE HOUR!!! Thanks for the great info! This will really help with my report on Colombia! Thanks a lot! That was VERY useful!!!!!!!!!!!!!! Also do you think you guys could add a section about holidays and special traditions? AWESOME!!!! Data and materials for the paper due on Columbia, it's history, culture and economis, including a background on it's religious path. Capital is Bogata, main crops are bana's and coffee beans. it's an excellent article about my beautiful country, Colombia. Thanks to whom wrote it. Hi, i realized that there is a mistake in the article, The name of the Island is San Andres, not San Andrea. i think the information i retrieved from this site is very beneficial and than this site is also doing great in the prvision on important information on behalf on The Corporative Republic Of Guyana i kenisha Hutson say congratulations to this site for their hard work and dedication for making this all possible ha ha ha ha ha!!!!!!!!!!!!!!!!!!!!! This was extremely helpful!! Im doing a group project on Colombian culture for one of my classes and it was so hard finding all the info I needed. I get on here and I find everything all in one place! This just made my night! This article is very helpful. Specially for kids looking for information about the country. My son was looking into our family heritage and found it fascinating and I found it very educational. The pictures are fantastic and give insight as to how our country is changing. Thnak you. Wow! thanx this was really helpful! other websites i tried didnt have that much info. This is a lot of help for school projects. I am from barranqilla,colombia and this is very long but it has alot of information and I am doing a report on Colombia. oh my goodness this is the best site i found so far. Where's the info about the clothing about the Colombians? Or does this site not have it? P.S. Can u think about adding a section about what colombians eat? This site is great for any project when concerning Colombia! Thanks!!! awsome web.. can u add somrthing with thier dances and stuff like that?? I'm doing a project on Colombia, and this was very helpful because I needed a picture of a Colombian woman in her native dress. 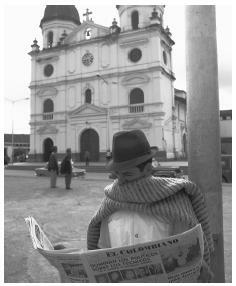 Been Colombian by birth it did give a great pleasure to read the whole articule about Colombia. For over 40 years I never touched Colombian land till 2 years ago, I stay in Bogota and is a very different city from the one I grew up. I have see that is not only different but is better. The restaurants, stores, public places etc., are real good. There is only two things that I don't like, first the traffic it is bad second too many apartment buildings, maybe is too many people living in there. Maybe next time I go I can give you first hand information of what is happening in Colombia. Congratulations for this article, so far the best. This page has helped me alot with my Colombia powerpoint presentation. I thank those whom put it together. It was very resourceful! I will continue to read this on Colombia.My plans are to visit in th very near future.I still have family thee,eventhough,I s born there but raised in New York and Miami.There is an unbelievable desire in me to know my motherland.Thank You for the awesome information !! great annd helpful information :) it helped me learn more about colomia and help me do a reaearch paper i have to do for spanish it helped me understand more about there traditional foods and there political and religon. Thank you so much for the info in this web site. We are going to host a young girl from columbia in our home. for the month of july. its very helpfull having some knolege of Columbia. this is one of the best web pages i used on my project and it tells a lot on the country and how beautiful it is. this is an excellent history about colombia. this is very useful for the cross cultural presentation. I'm doing a report for school too. about Colombia history. what about the music? Every region in Colombia has typical folkloric music. Just finished a project for my speech class.I got to make a presentation on Colombia. Great article!I had a spanish project due for school and this web site had the most info! Thanks! I have a backround from Colombia. It's great to learn about a place i going to! one question: what are the wedding traditions? I'm doing a detailed report on columbia and this helped me get the pictures i needed and the information to complete my final report. Thank You! I will most certainly get an A, thanks to whoever wrote this! Could you have a few paragraphs on what types of food they eat? If you could that would so awesome! Other than that the site is really good, history, some things on food... Thank You, so much! Oh yeah, do you have every single country, that's pretty imprisive! I love this website for my S.S project i found all my information on this website. This is a good website for information. I am working really hard on a project and you just helped me alot. Will use this website for good information and will probably get me a great grade. this wed site didn't help me much. it didn't tell me anything about who cooks the food or why. This was an amazing site! I recommended it to my entire class, and it gave them a lot of helpful information. OMG! thanks for all the info. I needed for a huge Social Studies project that counts as a huge part of my grade.. It counts as a huge test! My sister-in-law is Colombian and lives with ny Brother in Australia. She is expecting her first child later in the year and I will hosting her baby shower. Is their anything I need to be aware of in organising the shower, any specific customs? We hope her Mum comes over for a few months too..
Great site. Great information. Helped me with a cross-cultural health care project! Now I want to travel their. Thank you so much for all the helpful information. It was so easy to find everything I need for my research paper. I would like to see more information on the different types of food they eat, but other than that the website was very useful. it doesn't even say anything about colombia's traditional clothing. This article has been a great resource for my Latin American History class. Thank you very much! I also found it to be a great read. This is very useful info for my school report, but could you add a section on the indigenous population's culture please? This is one very informative site and Ihave been to Colombia but once and as soon to return. It is quite different from North America and as a American I feel that there is a underlying judgement and not quite sure of it but I was treated with respect and noticed the Colombians often staring at me . I was surprized at the difference in the social ecomomics and how much poverty exists ...rubbing shoulders with wealth/// what a injustice as is mentioned in the afore articles. What about the bags everyone carries, and the regional arepas? ..well im looking for the colombian traditional dresses but this one appeared..but its nice..
very well put together, helped with 25% of my project. Thanks, this is great help for my school project on Colombian art. Just one question: who wrote this? -I need to know in order to cite this article. -thanks! hey this was very helpful its funny because im from colombia and this information is quite accurate. my teacher asked me to do a report on my hometown like a powerpoint thing i dont know why? i could have just flat out told her. but this is really helpful information,thanx. Hello to all! Anyone interested in knowing more feel free to ask. I can and will answer your questions as I am now a resident of this beautiful country. can anyone tell me where is the clothing part of this? I cant fnd it!!! This webpage about Colombia was well done. This is the first time that I read something realistic and precisely about this beautiful and unique country. Very helpful for my social studies project if you understand the main idea like I do. Awesome Info!! This website helped me out quite a bit; thanks for putting this on the internet. Great site. Very helpful. I am preparing to move to Bogotá and found this information to be the best yet. Many thanks! Wow, this was truly amazing. I do say, I very much appreciate this. I have cross checked this source with others, and this is right on! Thank you so much! i'm doing a project about Colombia and this helped me a lot thanks! I am from Bogota, Colombia but I love in the USA. This is the best in formation I have founf about my awesome country. for once it is not displaced as a place where there is no technology,everyone is indian, and children go to school barefoot because everyone is poor. GO COLOMBIA! Stupid colombians stop selling drugs and go back to your own country. Spain won't help you anymore since you declared your independance. where do you find the traditional houseing anyone have any ideas?? it would be nice if you added something about the traditions and holidays they have in columbia. that would be a graet help for me in completing my project. I agree they should put holidays and such I need this for my product that needs to be a good grade so I can pass. very informative, as usual!! i love this website!! I LOVE COLOMBIA my family is from their something i really like es la musicia y los bailas me enchanta! im happy my family is from their even though im not. i did a project on Colombia and this really helped me out. thanks to the maker so much! This is the best information I have seen in a while about my Country, and it is accurate. Thank you so much!!! i Highly Recommend this site for project use, as there for i found all the info i needed for mine, in as little as an hour! This really helped! Thanks! I highly recommend this web for other users! excellent article, too brief though to elaborate the charm and magic of colombia. this is a very long page but it is very helpful. i hope to get an A+ on my project. Very good website. Doing a project on Colombia and so far this is the only website with great information! Love it! I got all the information I needed and it Didn't take me Hours to find what I was looking for! This is very fantastic! This is such an amazing masterpiece! I've never seen anyone research everything so accurate about one country! Great job! Love this article! I am colombian and this is the only true information page about Colombia in the whole Internet. Don't believe the mainstream, they are trying to erase our social and historical memory and identity (not only our international image) with the presitions of the new massive cultural manipulation achieved by the highest levels of technology/data-minings techniques, and who would know what for, it is just unbelievable how much power they have, but peges like this demonstrate we were not dreaming our history. The social strata and caste section is spot on. A very skin color conscious society. Actually Colombia is not so much a skin-color conscious society. My wife's large family is composed of all colors and shades and many Colombians have friendships and date among all colors. Although this is a pretty good article, that it has no mention at all about estratos is a serious omission when discussing the socioeconomic aspects of life in Colombia. It's also light on discussing city, departamento and federal governments and how they are organized. thanks, this helped my project for school, its been really hard for me to find what to type for the last paragraph until I found this. The information is amazing, I like so much that foreign people can know about my beautiful country and for those people you are welcome to this place and remember is COLOMBIA no COLUMBIA. My daughters father in law and family is Columbian, and has a not very profitable farm outside Bogata in the hills. He has not much longer to live, unfortunately dying from advanced cancer, and is in and out of hospital. Family is very poor, cannot afford to pay medical bills etc. Im trying to do what I can from New Zealand. My son in law is over there, from Spain, with my 5 year old blind grand-daughter. She has had to go with him as there is no-one to look after her in Spain while my daughter works. Can anyone tell me what will be expected of my son in law at the funeral. As the family is so poor will he be expected to pay for it? - he has no money at all as he hasn't worked for over a year while my daughter works, and he has been babysitting - if no-one has money what will happen? Is the son meant to look after the mother?...I do not know what family there is over there at all. Money is so tight that they cannot afford the medical bills...is there anywhere they can go for help? Is there any form of death grant? If anyone can help I would be very grateful, I don't know who else to ask and I don't want to add further stress to my son-in-law. This information was so useful it had everything i needed.All de rest of sites did not have any of this information this site is a life savor. I look forward to doing more research on this site. We are from colombia and i love it there. I used this website and it is awesome!! Thank you so much!! YES!!! This is EXACTLY what I needed for my presentation!! hello! I think that this information was very resourceful and useful to my project! Thank you so much for the information! This is super super good! Everyone else should just use this and skip the other sources cause this is the only one my teacher says is okay so far. This is so cool! This is just exactly what I need for my presentation! !